By Istvan Siposs and Michael Whitaker. Please Note: While this book has numerous RTML tips, it is not a book on RTML. If you need a book about RTML, consider RTML 101. Red Blocks instead of images? This booked is aimed at Yahoo Store developers, designers and merchants who are familiar with the Yahoo Store Editor and the template editor. Or put another way, those people who are lucky enough to work on the Yahoo Store platform on an almost-daily basis! As such, this book will not teach you how to use the template editor or how to write RTML templates; if you are looking for an introduction to templates and RTML please check out www.ytimes.info. We also assume a familiarity of common web technologies, such as HTML and CSS. 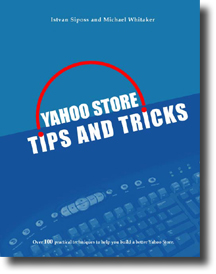 "Yahoo Store Tips & Tricks" is a comprehensive compilation of tips and tricks for the Yahoo Store platform that we have put together over the past few years. Much of what we do as Yahoo Store developers can best be described as solving problems (or at least coming up with acceptable workarounds); similarly, the tips and tricks in this book are meant to provide solutions to specific Yahoo Store problems you might encounter. Ranging from simple editor configuration tips to advanced RTML templates, this book is not meant to be read as a book from start to finish, but rather to serve as a "cookbook". Each tip or trick is a self-contained "recipe" that can be used when the occasion calls for it. "When Mike and Istvan asked me to write the introduction to this book, I was very excited for two reasons: First, I just wanted to read the dang book and get the good stuff for my own stores before everyone else did. Second, I wanted to steal the really good stuff for my "Yahoo! Small Business / Yahoo! Store For Dummies" book! All teasing aside, you really need to buy this book if you are serious about making more with your Yahoo! Store. It shows you over tips, tricks, tweaks, and templates to jazz up your store. You can do something with this info almost immediately, too! I was editing templates after about 30 minutes of diving into the book. Buy this book if you are a Yahoo! Store owner. Improve the look and feel of your Yahoo! Store without touching custom programming or RTML. This book shows you specific store features you can add or enhance with RTML template tweaks. It also shows you exactly how to do it! Not a programmer? Me either! If you don't want to wade into the thick stuff, read the overviews, skip the code, and buy a copy for your favorite geek. You can always outsource this stuff, too. Open up your wallet or your Paypal account and hire a Yahoo! Store developer. There are dozens of RTML guys (and gals) who can implement RTML template changes for you. Buy this book if you are an RTML developer. You'll learn enough from one or two little tricks to more than pay for the price of this book. I think they should charge fellow developers $500 or $1000 for the tips and tricks alone, much less the template examples. Mike & Istvan have forgotten more RTML than I'll ever know. I was playing with RTML back in the good ole days, but I didn't know what I was really doing until their books came out. I am NOT a programmer. I'm a retailer turned internet marketing consultant who had to learn to hack RTML to be able to make my Yahoo! Store pages look the way I wanted to increase conversion rates and to make the pages as search engine friendly as possible. Mike's book ("RTML for Yahoo! Store - A visual quick-start tutorial to modifying templates") got me deeper into modifying RTML templates. I could already do cool design stuff with RTML with tables, but I was afraid to actually do any programming until I read his book. Istvan literally wrote the book on RTML with "RTML 101." I re-read Istvan's RTML 101 book for the 17th time on the flight out to their latest training seminar. Wow! I'm still amazed at how Istvan was able to reverse engineer all of this stuff with almost no documentation from Yahoo! Mike & Istvan's "Yahoo! Store Tips & Tricks" shows Yahoo! Store owners how to do two very important things: 1) save time by speeding up daily store editing and maintainence tasks and 2) make more money by creating a faster and easier shopping experience for customers. Highly recommended." It is now. As of March 14, 2014 we no longer offer this book in print. An excellent reference with clear instructions on how to do things on the the Yahoo store. Yahoo Store help has gaps and inconsistencies whether it's old documentation or no documentation this fills some of the gaps with accurate information. This book is a great resource for anyone wishing to take their Yahoo Website to a new level. Book was shipped very fast and in mint condition. Great to business with YTimes. An excellent resource for Yahoo Merchants. Istvans extremely useful Yahoo Store & RTML books are required reading & reference materials for both beginning & advanced Yahoo Store Owners. This review comes with my highest recommendation. Thank You yet again! This is the third purchase I have made from here, and as always a great experience!. Love the book, its absolutely great! yTimes is the solution for yahoo store improvements and yahoo website development work. Once again, work done well in timely manner! Thanks yTimes, you get my strong recommendation.